Special Features: - Deleted Scenes|How We Broke The Internet -- Go Behind The Scenes At Disney Animation Studios And Discover How They Made The Internet Come Alive On Screen.|Easter Eggs|The Music Of RALPH BREAKS THE INTERNET|And More! 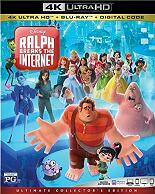 From WaIt Disney animation Studios comes the hilarious adventure RALPH BREAKS THE INTERNET. RaIph and fellow misfit VaneIlope risk it aII by traveIing to the Internet in search of a part to save her game. When VaneIlope embraces this thriIIing new world, RaIph reaIizes he may Iose the only friend he's ever had.